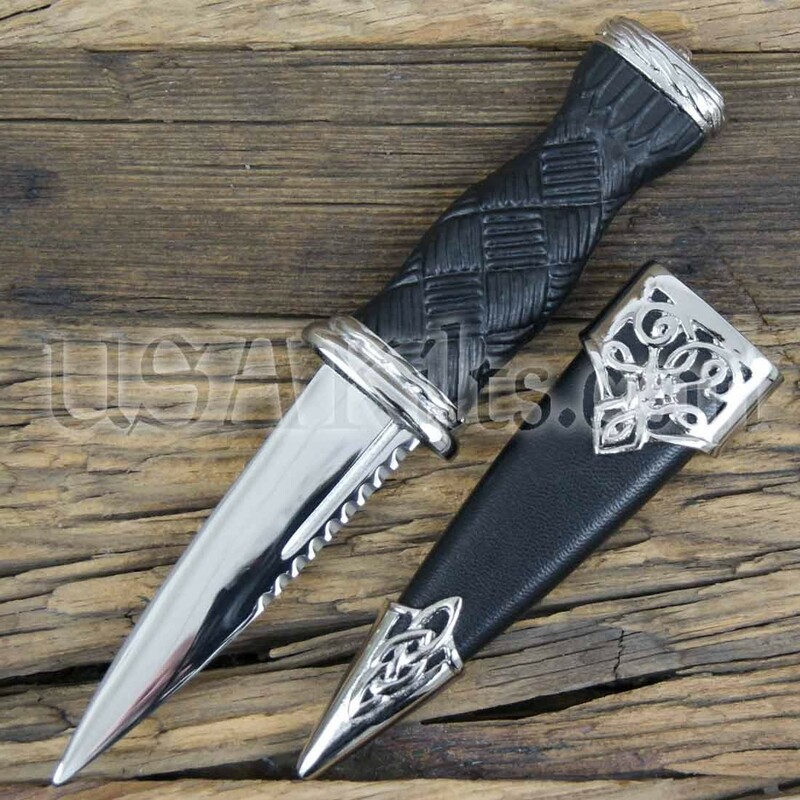 This simple dress sgian dubh has the silver cap on the top. It is made in the UK. Please note that the blade is NOT sharpened for your safety. i could not find my sgian dubh and needed one for Burns supper. Called USAK and they shipped to me in time. Great looking knife, very comfortable to wear. Although described as a “plain dress sgian dubh”, plain is a relative term. The metal fittings are in a Celtic knotwork style. The handle, while synthetic, looks like a traditional blackened bog oak carved with a woven ten strand sennit pattern. Even looking quite closely it still resembles bog oak. The sheath is presumably also a cast synthetic, but it is covered in sewn on leather, very neatly done and neatly fitted with the above described metal knot work style fittings. The blade itself is properly symmetrical in taper with a single edge. It has a small fuller let into each side near the non-edged side. The engraved name of the company is so nicely done that it is more a mark of pride of the manufacturer than it is an advertisement. These are described as “not sharpened”. Obviously we could assume that the edge is at least “dull”. In fact it is slightly squared off and wouldn’t cut anything under any circumstances. If you want to sharpen this mirror finish stainless blade, I’d only do it if you’ve been trained properly in sharpening tools. No high speed grinding. A very low speed water wheel to get down to a decent edge, making sure the blade is always cool. I’d do the final sharpening with a 1000 grit water stone to put a razor edge on it and remove most of the scratches. Then I’d follow this with a 6000 grit water stone for polishing it back to a mirror finish so that you can see your face in it and read printed words in the reflection. Also remember that one side of both the sheath and the handle is flattened to rest against the calf of your leg. Naturally enough this pre-supposes that the wearer is right handed and will keep it in his right side hose. In that position when you pull out the knife the side with the edge will be down as for cutting food. However the person who is left handed will put it in his left hose and if the knife is drawn the sharp edge will be up, which might lead to an embarrassing attempt to cut something with the side of the blade that doesn’t have an edge. I don’t have a single criticism of this sgian dubh. You’d have to really pay quite a bit to a custom blade smith who’s a real artist to get a better one. I know of some of these fellows and their work doesn’t come cheap. Wooden and Stag Horn sgian dubhs are used more for casual and ‘day wear’ type outfits. Dress sgian dubhs (usually black in color with or without a stone on the top) are typically reserved for formal functions. If you choose to wear a sgian dubh, we highly recommend wearing flashes… The elastic band on the flashes helps to keep the sgain dubh “secure” in your hose top. Without the flashes, the sgain dubh may easily fall out (and get lost). Also, think about where you're going before tucking your sgian dubh into your hose... Many buildings have security screenings and a Sgian Dubh may be confiscated as a weapon. When in doubt, leave it at home or check it in your luggage. 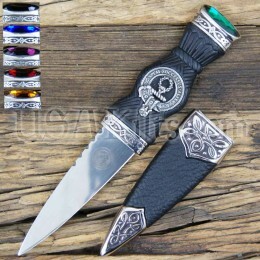 Sgian Dubh, literally translated, means “Black Knife”. It was originally concealed in a small pocket, usually sewn into the armpit area. When in the company of friends, it would be taken out and tucked into the top of the kilt hose as a sign of respect (i.e. not hiding a weapon). Today, sgian dubhs are usually more decorative than utilitarian. They are worn by tucking about 2/3 of the (sheathed) knife into the top of the kilt hose. Which leg it is worn on is determined by the dominant hand of the wearer (right handed guys put it in their right leg’s hose). 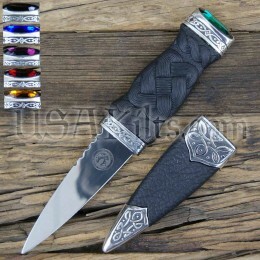 We try to keep this sgian dubh in stock at all times. In the rare instance that it is out of stock when you place your order, we will let you know within 24 hours.